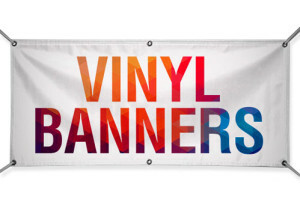 Vinyl banners have many uses and applications. They are most often used to promote a company’s logo, a special promotion, event, team or school. Since vinyl is a very flexible as well as portable material you can see vinyl banners just about anywhere. Vinyl banners are commonly seen as billboards, table banners, trade show banners, building banners, street banners, festival banners, as well as stadium flags. Contact Mozip for a free quote on your next printing project.